As we know that every top-level window has a menu bar associated with it. This menu bar consist of various menu choices available to the end user. Further each choice contains list of options which is called drop down menus. 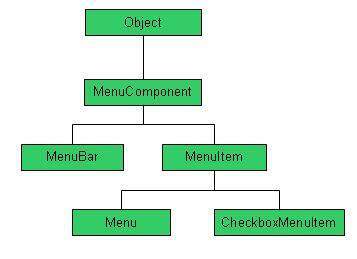 Menu and MenuItem controls are subclass of MenuComponent class. It is the top level class for all menu related controls. The MenuBar object is associated with the top-level window. The items in the menu must belong to the MenuItem or any of its subclass. The Menu object is a pull-down menu component which is displayed from the menu bar. CheckboxMenuItem is subclass of MenuItem. PopupMenu can be dynamically popped up at a specified position within a component.